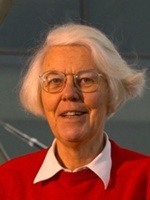 Karen Spärck Jones (1935–2007) was a British computer scientist. Her specialties were natural language processing and information retrieval. Spärck Jones had a long history in experimental investigations of human language and was the originator of the Inverse Document Frequency measure in information retrieval. Awards Spärck Jones won in her lifetime include Fellowships of the American and European Artificial Intelligence societies, Fellowship of the British Academy, the ACL Lifetime Achievement Award and the Lovelace Medal of the British Computer Society.